Below are suggested charges for seat weaving labor. Remember to add the cost of materials to your labor. Remember that some geographic areas charge more and some charge less. Charge what the market will bear in your area- based on cost of living. You should always feel comfortable that you're earning a fair wage for your work. How much should you charge for labor to re-seat a fiber rush or seagrass chair? $4.50 per inch, measuring the longest chair rail. Add materials cost to this. How much should you charge for labor for re-caning chair seats? Generally, the current charge for re-caning chair seats with holes ("hand caning") is a minimum of $2.50 per hole. Some areas get a lot more: $4 to $5 a hole. Complicated patterns may be charged more. Count the number of holes around the entire frame and that's the $ amount that you should charge for labor alone. Check around in your location to see what others charge so that you're not selling yourself short. Add your materials cost to the labor charge. 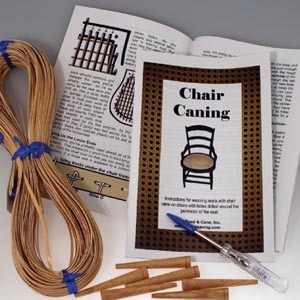 BLIND caning (also called Continental or French Caning) should be TWICE the charge as regular chair caning, or at least, $5 per hole. It takes twice as long to weave since each strand of cane needs to be woven and glued in place. It also frequently involved glueing pegs in place. How much should you charge for labor for Binder Cane seats- like New England Porchweave, Finger Lakes Fan, Herringbone Weave? Labor for New England Porchweave or Finger Lakes Fanweave and other seats in Binder Cane is $ 6 per inch. Measure the longest rail. For example: 15" across front rail x 6 = $90 labor per chair. Add the cost of materials to the labor charge. How much should you charge for Splint Weave seats woven with Flat Reed or Ash? $5.50 per inch, measuring the longest side. Add materials costs. How much should you charge for Shaker Tape seats? $4 per inch, measuring the longest side. Add materials costs. How much should you charge for labor to re-seat a chair with cane webbing?